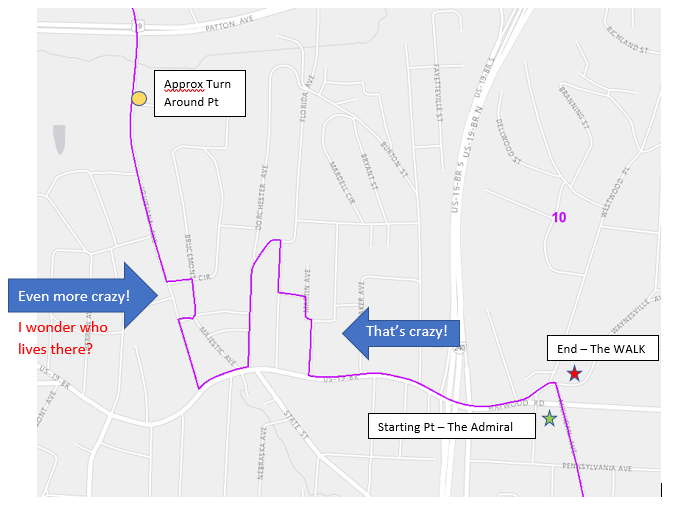 Not-So-Fun Run: Joggers In 'Gerrymander 5K' Must Run Oddly Shaped Route : The Two-Way The course highlights the zigzagging line separating North Carolina's 10th and 11th Congressional districts. One expert says ugly districts are a symptom of a problem, not the problem itself. 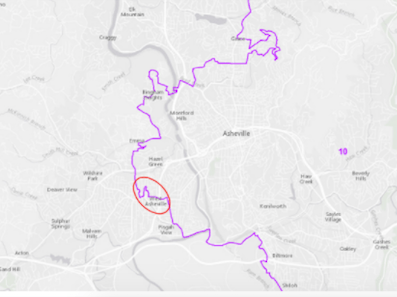 Runners in the Gerrymander 5K will trace the boundary of two congressional districts that split Asheville, N.C. The route for the Gerrymander 5K, as drawn by its sponsor, the League of Women Voters of Asheville-Buncombe County. "Roughly speaking, they'll begin at The Admiral at 400 Haywood Road, go west on Haywood Road, north on Martin Avenue, west on Balm Grove Place, north on Balm Grove Avenue, southwest on Florida Avenue, south on Dorchester Avenue, west on Haywood Road, north on Louisiana Avenue, east on Majestic Avenue, north on Brucemont Circle, west on Brucemont Road and north on Louisiana Avenue to the turnaround point near Patton Avenue. The return trip ends at West Asheville Lounge and Kitchen, 401 Haywood Road. 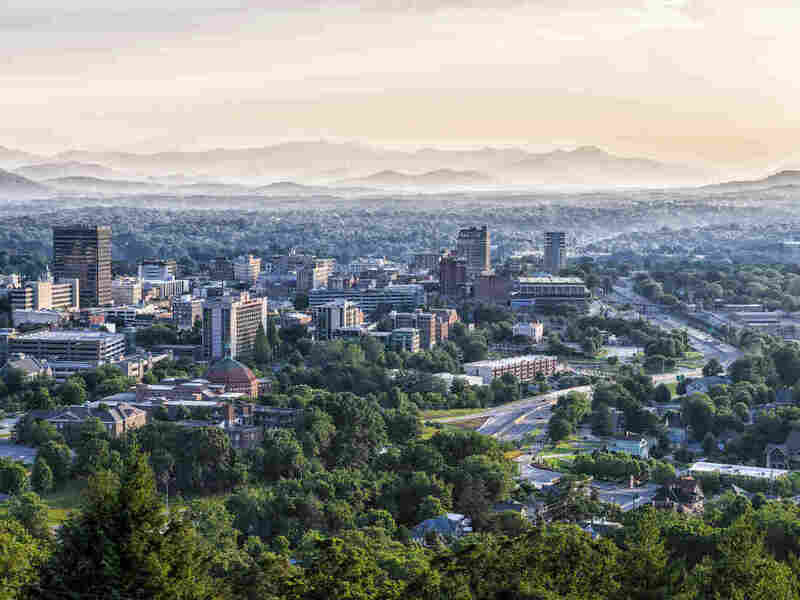 "For any poor souls following this on a map, runners and walkers will have the 10th District, represented by Rep. Patrick McHenry, R-Lincoln, on their right on the outbound leg and the 11th District of Rep. Mark Meadows, R-Buncombe, on their left." The course creates "a visceral experience of how gerrymandering divides our communities and doesn't make sense. Why include this house but not another?" Alana Pierce, president of the League of Women Voters of Asheville-Buncombe County, told Runner's World. The league is sponsoring the run/walk. Gerrymandering is the drawing of districts in a way that gives one party an electoral advantage, generally by spreading the opposition across districts or packing its voters into as few districts as possible. North Carolina's congressional districts have been repeatedly challenged in court. The League of Women Voters has filed five lawsuits since the state was redistricted in 2011; the group wants a nonpartisan committee to redraw the districts. Federal judges ruled in 2016 that two of North Carolina's congressional districts were racially gerrymandered, spurring Republican legislators to hastily redraw the state's district map. Now those districts are being challenged (including by the League of Women Voters), and a panel of federal judges will rule on their legality in the coming weeks or months. "North Carolina has some of the worst partisan bias in the country, both under the 2011 and 2016 maps," says Michael Li, senior redistricting counsel at the Brennan Center for Justice at NYU School of Law, a nonpartisan law and policy institute. He tells NPR that the state's congressional districts consistently favor Republicans "to an unnatural degree." "We did a study and we found that North Carolina is among the top three states for bias. It gives Republicans a 10-3 bias in a state that votes 50-50," Li says. "When it comes to the congressional map, Republicans have had a safe 10-3 majority for most of a decade." Republican state Sen. Ralph Hise, chairman of the state Senate's redistricting committee, has called a nonpartisan redistricting commission "mythical." Back in western North Carolina, the Gerrymander 5K has been more than a year in the making. J.P. Kennedy, an artist, musician and documentarian, was angered by the adoption last year of HB2, known as "the bathroom bill." "I was so outraged that we were treating our transgender community this way," Kennedy told the Raleigh News & Observer. "I was like, 'Who's my representative?' That's when I started seeing how crazy our North Carolina maps were." Kennedy and his family and friends used a bucket of sidewalk chalk to draw the sinuous district boundary through the community. Then his wife, Cinnamon, also an artist and musician, had a different idea to demonstrate the line's strange shape. "My wife said, 'People in this community love 5Ks. ... Why not make the district line a racecourse and have people out there on it so they can see and experience the problem?' " Kennedy told Runner's World. "I thought that was brilliant." Though the district's boundary will make for a notably strange racecourse, the Brennan Center's Li says that funny-shape districts are a symptom of a problem — not the problem itself. After all, North Carolina's 10th and 11th don't look especially strange by the standards of American congressional districts. "You have to look behind the map," Li says. "The real problem isn't that the districts are ugly. The problem is that they lock in a 10-3 vote in a state that is 50-50."